1. What is Outlands Running on and Where is it Located? Outlands is running on a high-end server with a host that offers premium support and DDOS protection. Outlands staff is committed to financing, maintaining, and improving the server environment as long as there continues to be interest from the players. The server is hosted in Chicago. You can ping play.uooutlands.com as a sample of your connectivity. For more information on connecting, please click here. Having problems connecting? Connect to our Discord and look for help in the support-newplayer channel or the client-launcher channel. 2. What Clients Can I Use? Sallos? Orion? The classic client, Steam, and Razor, are all supported and installed as a part of the Outlands Installer. There is also a custom Outlands exclusive ClassicUO fork being developed by Jaedan and Karasho, which while functional, is not complete. Grid Loot works with steam, however humanoid mobs will display items that are not actually lootable. Any issues encountered while using Orion should be reported to Jaedan in the apps-and-scripts channel in Discord. 3. How Many Accounts or Characters Can I Have? Please contact an administrator if you have special circumstances (such as a family playing together, or roommates.) Proof will be required. Please check out our Discord for a complete list of rules posted in the rules channel. Macroing will always be a core tenet of Ultima Online, however you will find that being active is far more rewarding on Outlands. While macroing is allowed, killing a (non tame, non player) creature will provide a 5x skill gain rate for 10 minutes, with the exclusion of Crafting skills, Harvesting Skills, and Animal Taming. There are no macro restricted areas, and no areas where macroing will have penalties skill gain. However, skills will only go up to 70.0 within the New Player Dungeon and Shelter Island. 5. What Era of Gameplay is Outlands? Are there Mounts? Outlands does not have a set 'era' of gameplay, however many of the PvP mechanics are tailored to a T2A style Felucca rule set. There is no trammel on Outlands, but we do recognize the steep learning curve that Ultima offers, and understand the importance of fostering a good first impression. 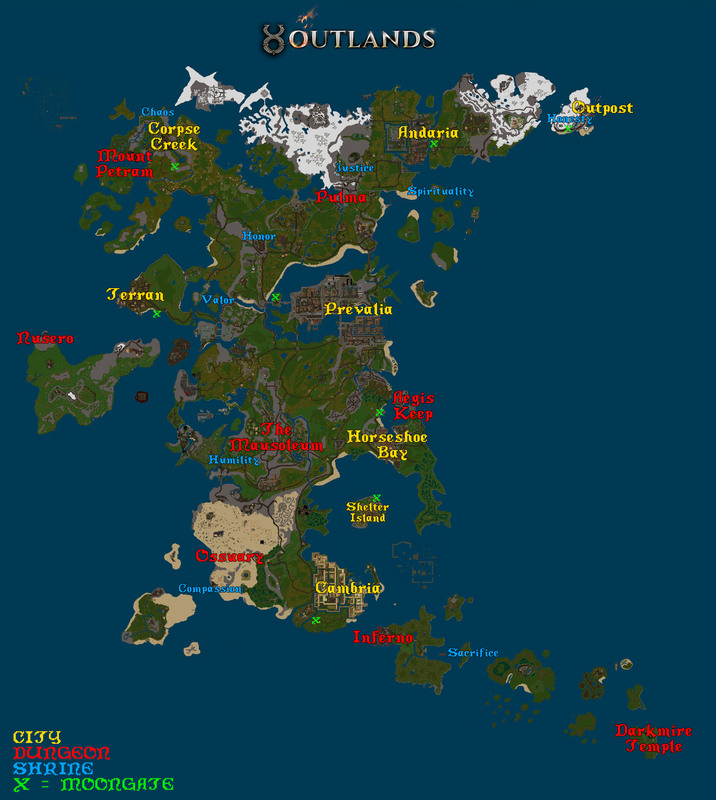 To that end, Shelter Island is an aggression-free zone to provide new Ultima players, or players new to the server, an ability to gain some footing before entering the merciless wilds. Shelter Island has a large amount of protections in place to prevent abuse, including a New Player Dungeon and vendors that are only accessible by [young] players. Town killing will not work altogether, although stealing will still function within town. You are fair game anywhere else outside of guarded zones. While dungeons contain creatures with heavier gold sacks, there is an added level of danger within them. On Outlands, there is no recalling into our out of dungeons, with the exception of a few golden moongates near the entrances of the first level of a dungeon. The only escapes from a dungeon are the way you came in, or red moongates found sparsely (typically 1 per level) on levels 2+. Outlands aspires to recreate that old dungeon crawling experience, and we recommend you bring a friend! You will certainly need the help for the dungeon bosses and mini-bosses. Outlands has a wide variety of mounts, including a mount-breeding system for those who want that super rare hue! Mounts function in towns, overland, and in half of faction struggles (PvP events). Mounts do not function within dungeons, subterranean areas, or in half of faction struggles. Mounting and unmounting when entering mount-prohibited areas is seamless. Your mount will "Find a place to graze on grass" when entering an area where mounts are not allowed, and will reappear (with you mounted) when exiting. In addition to the entirely new, hand-crafted map - you will venture into a variety of customized thematic dungeons, tour vibrant unique towns, and explore the many individual points of interest. Some of the mechanics above have all new customized content as alternatives, such as Societies and over 125 original housing designs available for purchase. Please see the 'Does Outlands Have any Custom Content?' section for more information! 6. What is PvP Like on Outlands? Outlands has a few ways to participate in PvP that cater both to the individual player and to a group/guild. Outlands has a customized area on the map specifically for Arena fighters and spectators. The arena features 9 dueling pits of various tile sets, with pit sizes capable of accommodating 1v1, 2v2, 3v3, or even 4v4 duels. Grab a friend or challenge another player to a duel without fear of losing your items. The Arena also offers customizable rules for duels. Don't want poisoned weapons to be used? You can set a rule so that poisoned weapons are not allowed in the pit. You can even choose to allow only a certain number of poisoned weapons for a particular duel. Check out all of the rules and options for duels at the Arena Stone located in the center of the arena. The Arena also plays host to weekly automatically scheduled tournaments! The tournaments vary in both size and rules to give everyone an opportunity at blood and glory. Tournament winners will be warded Arena Credits that can be redeemed for new clothing art, unique spell hues, prestigious arena dyes, and much more! Looking to be part of a team greater than yourself, or interested in finding random combat in the world? Factions may be for you. On Outlands, we have 3 factions, 2 of which you may be familiar with. Order and Chaos are factions as you know them - members on the same faction are on the same team, while opposing factions flag as orange, and are attackable anywhere. Freedom is a faction for someone who likes a challenge and revels in any form of combat. The Freedom faction has no alignment, every other factioner is fair game. Will you fight for Chaos, uphold Order, or test your combat prowess against all takers in Freedom? Faction struggles are events that happen multiple times a day to cater to players in multiple time zones. They are king of the hill style matches set in dungeons, the overland, and even in towns! Freedom struggles pit Order against Chaos to see who can come out on top with the most points at the end of the match. Anyone who joins from the Freedom faction will automatically fill into either side to obtain optimal balance. Living up to its name, Corpse Creek is the land of the lawless. It is a town and surrounding region where all players are fair game, and nobody is innocent. Any player (or pet) in this region, regardless of previous notoriety, will flag grey. Players who are killed here will not be able to give murder counts. Murderers who are killed here will not be subject to any murderer penalties like they would be elsewhere in the world. The surrounded lawless area does have housing opportunities if someone is so brave. You will receive a message upon entering or exiting this area. Heed this warning, because it is the only one you will get! What is Ultima Online without the constant fear of death and dismemberment? Outlands is no exception. If you want to be what other players fear, nobody will stop you except potentially other players. Should you kill enough innocent players to receive 5 murder counts, you will become 'red' and a murderer. Murderers can redeem themselves and become 'blue' or innocent again should they choose to. Short term murder counts decay at a rate of 1 per 72 hours, although this timer resets should temptation call your name, and you kill another innocent player. Long term counts can be reset upon "repenting" after dying. This is just a small portion of the murderer system. More information about resurrection penalties and repenting can be found here, and information about player killing can be found here. Please see this player guide for an in depth look at PvP mechanics and tips. 7. Does Outlands Have Any Custom Content? ...And not to mention the completely customized map, containing tons of points of interest, that has over 7500 hours of work put into it by Owyn! 8. Are There Custom Houses? There are no player-made custom houses, as those houses often end up being in poor taste, or are just dirt rectangles. To replace that, Owyn has created over 125 unique housing designs of varying sizes that will satisfy most tastes and desires. The houses range from small 1-room humble abodes to massive multi-level mansion that have their own courtyard. There is even a house with a windmill! Of course, if you are feeling nostalgic, the classic houses are also on Outlands. Houses require a fairly lengthy amount of time before they finally reach the IDOC phase. Once a house is in danger of collapsing, the house will collapse within 12-24 hours on a random timer. Nobody will "know" when a house will collapse with any certainty. Going on vacation? Fear not, houses take a generous amount of time before you are in danger of losing your house. Additionally, any friend or co-owner of the house can refresh the timer simply by opening the door. Not sure if you can place a house somewhere, and scared to buy the house if you are wrong? Enter the Home Survey Tool! The survey tool will not only allow you to see where you can and cannot place a house, but will give you details about why a tile may not be valid for house placement. 9. Is There a Stat/Skill Cap? What is Skill Gain Like? Each character on Outlands can have up to 225 total stats, with a max individual stat cap of 100. For example, a PvP mage type character would typically have 100 strength, 25 dex, and 100 intelligence. Each character on Outlands can also have up to 700 total skill points, however this is expandable to 720 total skill points through rare in game loot drops. Individual skills start out capped at 100, but can also be raised to 120 through rare in game skill scrolls. Skills that are considered PvP oriented do not have skill scrolls associated with them, and cannot be raised to 120. Some examples of PvP oriented skills: Magery, Weapon Skills, Tactics, and Magic Resist. Outlands takes a PLAY to win approach rather than a PAY to win approach. There are no in game advantages from donating, no skill balls, and no ability to buy advantages over other players. Shelter Island and the New Player Dungeon grant a 10x skillgain bonus at all times. Effectively, skills gain at 10 times the rate of normal in the starting area. For more details on Shelter Island and the New Player Dungeon, please see the "I'm on Shelter Island, What Do I Do?" section of the FAQ! Note: The activity skill gain bonus and the New Player Dungeon bonus do not apply to: Crafting skills, Harvesting Skills, and Animal Taming. 10. What do Characters Start With? How do I Choose My Starting Skills? Ultima online has a plethora of skills that can be mixed and matched however the player chooses. Some skills generally work better with others, but every skill has a use. Choosing the right starting skills is crucial, as you do not start with any gold on Outlands. Instead, you start with a generous number of starting items that are thematic and complimentary to the skills chosen. If you are unsure, you can also choose one of the premade templates that will do all of the work for you. Choosing the advanced template will grant you the starting items from the 3 skills chosen, as well as a 1,000 gold check that can only be used to train skills from vendors. These starting items are bound to your character, and are unable to be traded. Note: The Spellstone that is associated with magic starting skills can stack. For example, taking both Magery and Meditation will grant you a 500 charge Spellstone. The Spellstone substitutes charges for reagents as a boost to starting out mages. Each circle of spell corresponds to 1 charge which is consumed even on spell failure. For example, casting fireball will reduce the charges on your Spellstone by 3. 11. So, Skills Function Different Here? Skills work differently on Outlands than on any server you have played before. Every skill has a place, and many skills serve multiple purposes or provide benefits in addition to their normal function. While many skills still have the intuitive uses that you may be familiar with (Fencing is still about spears, and Magery is still about Ebolts), some have bonus effects, while other rarely used skills have been entirely redesigned. For example, Spirit Speak is not just for communing with the dead and camping is not just for logging out faster. Instead, Spirit Speak provides a multitude of bonuses to Magery, including buffing spells and summons. Camping can be used for traveling the world, increasing the amount you can carry, and even provides a benefit to your melee and spell damage! There are many more skills that also provide bonuses to your melee and spell damage, most of which also apply a fraction of that bonus in PVP situations. Click here for an in depth look at all of the unique changes to skills on Outlands! Keep in mind, there is a maximum 20% bonus to damage in PvP situations. Most skills scale in effect proportional to the level of the skill. For instance, using Herding on a monster will increase the damage that your pets do to that monster by 25% at 100.0 herding, but will only increase the damage by 12.5% at 50 herding skill. At a maximum of 120 herding (through skill scrolls) a player’s pets would gain 30% increased damage. Utility skills scale by adding more benefit. For example, higher levels of camping allow you to unlock and hike to additional destinations! 12. Is There a Difference Between the Weapon Types? Each weapon type with the exception of Aspect weapons has a base 10% base chance to inflict a weapon special attack. Arms Lore further increases this chance by an additional 10% chance at 100 Arms Lore. - Interrupt: Fastest swinging weapons, lowest overall DPS. - Grinding (light): Faster swinging weapons than Grinding (medium) with more overall DPS than Interrupt weapons, but slightly less than Grinding (medium). - Grinding (medium): Slower swinging weapons than Grinding (light) with the highest overall DPS of weapon types. - Burst: Slowest swinging weapons, with the highest top-end damage. Typically used for burst damage in PvP scenarios. Weapon skill that is used by the following: Bows, crossbows, and heavy crossbows. - The special hit inflicts an additional 50% damage. - Hinders the target (prevents all movement, casting, melee attacks) for 4-8 seconds. - Hinder effect duration scales based on weapon speed (slower archery weapons have longer effect duration) and creature difficulty. - If target is immune to being hindered or already currently hindered, the attacks damage will be increased by a further 50%. Weapon skill that is used by the following: Kryss, Warfork, Short Spear, Pitchfork, Spear, and Dagger. - Cripples the target for 8-16 seconds (increases chance for target to be hit with attacks by 10%). - Effect duration scales based on weapon speed (slower fencing weapons have longer effect duration) and creature difficulty. Higher dexterity will reduce the downtime in between swings. Weapon skill that is used by the following: Shepherd’s Crook, Club, Hammer Pick, War Axe, Mace, Maul, War Mace, Gnarled Staff, Black Staff, Quarterstaff, Warhammer. Higher dexterity will reduce the downtime in between swings. In PvP, hitting another player causes additional stamina loss. - Causes the target to take "bleed" damage every 3 seconds for the next 15 seconds. - Each bleed damage amount is 20% of the total weapon damage caused by the initial attack. - Also applies a "Lacerate" effect. - Lacerate increases the chance for players to inflict weapon special attacks against that creature by 5% for the next 8-16 seconds (scaled based on weapon speed). - A creature can only have a maximum of 5 Lacerate effect bonuses active at once (bleed can be stacked an unlimited number of times on a creature however). Aspect weapons are crafted end-game items that function as a part of the Aspect Mastery system. The weapons themselves provide no PvP benefit, but have varying PvM bonuses depending on which aspect weapon is being used. Please read more about Aspect Weapons and Aspect Gear Here. 13. I'm on Shelter Island, What do I Do? Ultima Online is a sandbox game, you can do whatever you like! ...But for more practical advice, make sure you first take advantage of all of the starting items that your template granted you. You most likely have some stat (Strength, Dexterity, Intelligence) increasing items based on the skills you started with, use them! If you started with a custom template, you will also have a check for 1,000 gold in your backpack that is only usable to train skills from NPCs. This amount of gold is just enough to train up 2 skills to 50, don't forget to do this! Note: You will NOT be granted the starting items associated with skills that you train up from a vendor! Every character, regardless of template or skills, starts with a weapon. Even magic users will do well to make use of a weapon skill, at least to start with. Equip your weapon, and head into the New Player Dungeon. One following the road West past the stable master, then due North, and down the steps into the mountain. The other entrance is slightly more hidden. It is found by going East of the bank, then North-West into a mountain, past a miner, and down the steps in the back of the cave. Be wary, the cave entrance will have slightly tougher monsters to greet you! The highest you can raise any 1 skill to on Shelter Island or the New Player Dungeon is 70. After that, you will have to leave the island to continue to progress. Beware: once you leave the island, you will lose [young] status, as well as access to the Shelter Island NPCs and New Player Dungeon. Make sure you are ready! Shelter Island is a small place, with limited resources. Resources are also harvested at a lesser rate while on Shelter Island. You can start to harvest resources to get an understanding of how Smart Harvest and the crafting system works, but you will need to leave the island to effectively gather resources. Be warned, the wilds of Outlands are not always safe places, and it may be a good idea to get some weapon training in before adventuring out! I need more detailed help! A player named Yu the Sorceress has created a tremendously helpful starting guide here. For any additional questions, please see the support-newplayer channel in our Discord. There are three ways to leave Shelter Island - but be warned, you will lose your [Young] player status once you leave! The first exit is East of the bank, then North up the stone steps. North-West of the steps you will find a Moongate. Moongates will connect you to all of the other Moongates in the world, and are always open. The second way to leave Shelter Island is via the Ferry near the docks. Board the Ferry (step on the ladder), and you will travel to the Port of Prevalia. Similarly, stepping on the ladder while on the Ferry in Prevalia will bring you back to Shelter Island. The third way to leave Shelter Island is through a secret passage located in one of the buildings on Shelter Island. The details of this exit, and where it leads, will have to be discovered yourself! 14. Is it Just Me, or do Monsters Not Drop Much Gold? Outlands has taken a long term approach to game design. We want this server to be around for years to come. One of the ways to do that is to give the player challenging end game goals that will take some investment in order to achieve. - Gold drop rate has been reduced by about half. Inflation is always apparent in Ultima, but this is one of many steps taken to counteract the inflation process. In addition to the above, creatures drop different amounts of gold depending on where they are. 100% gold drop from creatures found in dungeons. 75% gold drop from creatures found overland, in non-dungeon areas. 50% gold drop from creatures found in the New Player Dungeon. The above changes were made to encourage players to adventure through the treacherous dungeons of Outlands, and to reward them for their bravery. - Vendor bought consumables have been increased (Reagents are all 3 gp, cloth and bandages are harder to obtain without buying it). - What vendors buy has been closely examined to ensure there are no 'get rich quick' schemes, in addition to not just buying anything. Your wares must have value! - The addition of many various expensive collectibles and wearable items, including new clothing art, housing expansions, and more! - Housing options that go above and beyond castles. Glorious mansions with courtyards, and rooms upon rooms upon rooms. Between the economic changes and the long-term goals below, we believe that Outlands has laid the groundwork for a fun and sustainable player-driven economy. There will always be something to spend your gold on! - A makeover of the guild system involving its own leveling system in the form of prestige. Powerful guild perks are unlocked as a guild grows and levels! - There are tons of player customizations in the form of emotes, added effects such as an explosion of blood when killing another player, and most importantly, a treasure trove of new art clothing. - Long-term achievements with appropriately rare rewards for completing them. - Aspect mastery system with its own experience and leveling. - Societies, or weekly quests that reward a special currency each week. Some of the higher rewards will require saving up! - Server rankings for just about everything. Most gold collected, Creatures guild, most Prestigious Guild, the list goes on! - Server rankings for the largest fish of various rare fish types. Some people just want a small place to call home, to serve as an anchor point to all of their adventures here on Outlands. Something like that won't take you ages to achieve, but for those that want to be the best, have their name in lights, or have a massive estate, it will take effort! 15. This Map is Amazing, But I am Lost. Is There a Map? Every character on Outlands starts with an Outlands Atlas in their backpack. The Atlas can show you the entire world of Avadon, the locations of places relative to where you are, a local map, and even provide you guidance on how to get somewhere. - Select "Show on the World Map" on the right side of the Atlas. Getting around in Outlands still includes Magery, runes, recall, and gating. Outlands also has Moongates near all major cities, an entirely new mode of travel that utilizes the Camping skill, and maybe even a few hidden teleporters. - Select "Show Arrow to Location" on the right side of the Atlas. - An arrow will appear to guide you to your location. Be careful, you may run into bandits, enemy players, or monsters along the way! Want something open on a separate monitor? Here is our high definition online resource that shows the full map, along with locations of the cities, dungeons, shrines, and moongates! Still not enough? UOMapper is an actively developed program similar to UOAM. It comes complete with marked locations made specifically for Outlands! 16. Okay, I Died. Now What? The bad news: You learned a difficult lesson, nobody is immortal. Also, anything not blessed will still be on your corpse, wherever you have managed to leave it. The good news: You can come back to life! As a ghost, you must find an ankh, a town healer, or a healer caravan. - Ankhs are located all throughout the New Player Dungeon, as well as at shrines. - There is at least one town healer located at every major city. - Healer caravans are located outside of every dungeon. Once you locate one of the above, unless you are a murderer, you will returned to life with 1 HP.